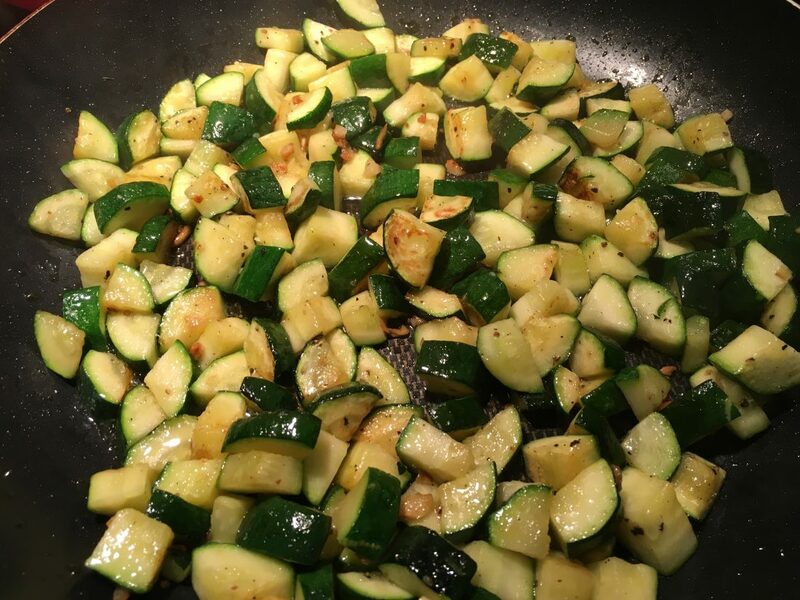 Zucchini simply sautéed in olive oil with garlic but packed with flavor. A super easy and super fast recipe I make as a quick side dish for chicken, beef, pork or fish. It highlights the sweet, natural flavor of zucchini. Zucchini simply sauteed in olive oil and garlic but packed with flavor. A super easy, super fast side dish to make. Cut off ends on zucchini. Cut it in half crosswise, then another half lengthwise. Cut it in half again lengthwise. Chop it into 1/4 inch size pieces. Heat olive oil in saute pan on medium heat. Add garlic into the pan. Let cook until garlic is fragrant (about 45 seconds). Mix in zucchini and turn heat to medium/high. Let cook for 4 minutes. Flip it once (you will see small brown bits on zucchini). Add salt and pepper to taste. Let cook for another 3 minutes.